ASTANA – The Kazakh economy has reached the point of stability, Deputy Prime Minister Yerbolat Dossayev said Jan. 31 during an extended government meeting in which government officials reported 2018 performance outcomes to Kazakh President Nursultan Nazarbayev. Kazakh President Nursultan Nazarbayev and government officials. Photo credit: akorda.kz. “GDP [gross domestic product] grew four percent, and 70 percent of growth was provided by the manufacturing sectors. The assets of the National Fund at the beginning of 2019 amounted to $61.6 billion. The unemployment rate is at a safe level of 4.9 percent” Dossayev reported. Nazarbayev noted the positive 2018 outcomes and said they resulted from good work by the government, the National Bank and regional akims. “The newly appointed Minister of Foreign Affairs Beibut Atamkulov was given the authority to synchronise the work of all levels, beginning from the Kazakh representations abroad to local administrations (akimats). This is a common task of the entire government,” the President said. Nazarbayev also said large companies from Japan, the United States and Germany sometimes leave Kazakhstan because the country lacks government systems to support those companies. He urged all branches of government to work together to retain foreign investment. “Each branch ministry, local administrations and national companies must appoint specific deputies personally responsible for the investment work. 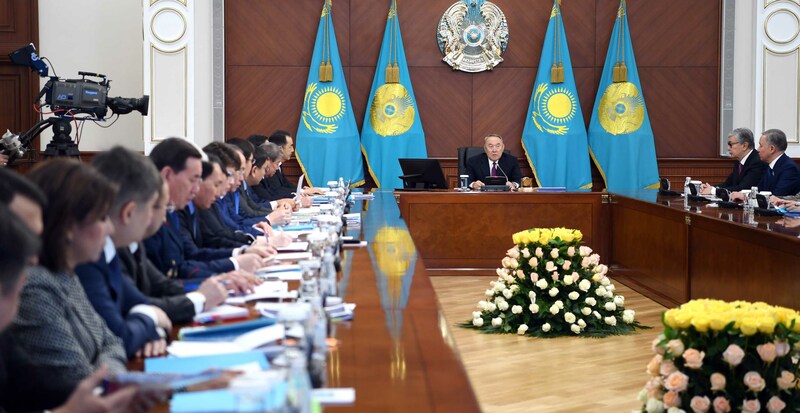 Therefore, [First Deputy Prime Minister Askar] Mamin, Atamkulov and [Minister of Industry and Infrastructure Development Zhenis] Kassymbek, you need to create a good interaction in order to hold a planned and coordinated work,” Nazarbayev said. Other government officials reporting on 2018 outcomes at the meeting included Prime Minister Bakytzhan Sagintayev, Chairman of the National Bank Daniyar Akishev, Kassymbek, Deputy Prime Minister and Minister of Agriculture Umirzak Shukeyev, Akim (Governor) of the Zhambyl Region Askar Myrzakhmetov and Akim (Governor) of the West-Kazakhstan Region Altai Kulginov.